Few films have celebrated bayou culture like Beasts of the Southern Wild. The post-apocalyptic film directed by Benh Zeitlin managed to capture the essence of Louisiana as seen through the eyes of a feisty little girl called Hushpuppy (Quvenzhané Wallis) who lives with her father Wink (Dwight Henry). The colorful epic in miniature was the rare film that transported audiences to a world so rich in detail you could practically smell the foods, touch the exuberant textures, and a big part of this was thanks to its breathtaking musical score, composed by Zeitlin and Dan Romer. The score also features collaborations from Lost Bayou Ramblers, who laid down the base for “Bathtub”, the piece that planted the motifs heard throughout the whole score. 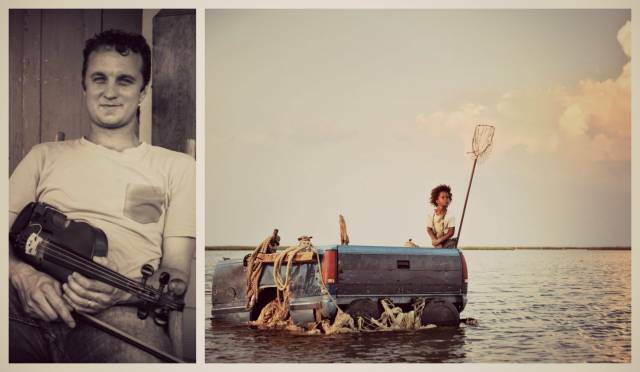 The Lost Bayou Ramblers in collaboration with Wordless Music Orchestra will present Beasts of the Southern Wild: Live at New York’s Symphony Space on January 23-24 where they will perform the score live accompanying a music-less print of the film created especially for this event. To celebrate the occasion we talked to Lost Bayou Ramblers’ co-founding member Louis Michot who elaborated on the process of making the iconic music for the film, shared anecdotes about collaborating with Scarlett Johansson and gave us a hint about the future of his brilliant band. You’ve been doing this piece live for a while now, right? Yeah, we’ve done a handful of concerts all over. I’ve done three concerts with the whole orchestra and then we did it twice in Los Angeles with a smaller orchestra. You’ve been living with this piece for more than three years now, but before Benh approached you for this, had you done any music for films? Not directly on the score, we’d done a lot of performing music in the films live, but not so much as being part of the actual score. Sometimes they’d use an entire song, but the collaboration part of it was new, which was awesome. How was this process different than writing songs for the band for instance? They wanted us to be more involved at the time, they were shooting way down South in Louisiana, and I couldn’t get out there all the time to be in all the scenes, but they still wanted us to be in the actual movie. They kinda had an idea of what they wanted us to do, partly it was to play traditional Cajun music, the type of songs they’d seen me sing a dozen times in New Orleans before that, "The Bathtub Waltz", which became the center for the Bathtub. They had us perform more of the melodic themes in our traditional form, so we just basically did what we do, we played them some new songs and then we did their melodies, which was the recurring musical theme in the score. It was actually very short, very easy and fun process. They came in to our studio in Lafayette and we did the whole thing like in two hours, and then we had to go to a gig (laughs). The movie came out months later, we got to hear it in its entirety and it was amazing, you could see our pieces at the root of the songs and then the score they built around it was just amazing. The collaboration between the orchestral and the traditional Cajun music was incredible. Was it strange to be thrown into the movie world? I’ve heard other musicians comment on how suddenly one day they find themselves sitting at the Oscars and it’s all so weird. Yeah, exactly! It’s a whole other world and an amazing view into that world (laughs). Fox bought the film and then all of a sudden someone from Fox wanted us to come play the score in LA. We were in the middle of our tour and we only had one day before we had to fly and work on Treme, but they wanted us to fly to LA, and of course I didn’t have any nice clothes, so Fox Searchlight bought me a suit. They got my measurements and had a suit waiting in my hotel room, which made me go “man, I can get used to this!” (laughs) but I played that one performance and then flew to New Orleans the next day to film Treme...the movie thing really adds to the musician’s ability to survive as a musician. But you’re not a complete stranger to being around movie stars, I mean Scarlett Johansson was in Mammoth Waltz, which I thought was really cool, because I love her album of Tom Waits’ covers. Was this part of the reason why you worked with her? Yeah, I love that album too and yeah exactly, she recorded that at the same studio where we recorded Mammoth Waltz and our previous album, so she finished that project the day before we arrived to record Vermillionaire, so we still had her essential oils and stuff, and tea and other stuff (laughs). We transitioned into the studio after they left so we got to take advantage of all the nice stuff they had bought. The house engineer became our producer, so that’s how she came on our album. I agree though, I love her solo album, and it was kind of a partial influence on Mammoth Waltz as well, our decision to even ask her to be in the album was because we could hear a female vocal in the song, and we’d never been a band to have a female vocal at all, so of course we were like “let’s call Scarlett” and she did it and she killed it! You’ve been playing Cajun music since you were a kid. Would you say this was only natural growing up, or was part of your mission to bring the richness of Bayou culture to people in the rest of the States and abroad? It wasn’t our initial intention but it quickly became a reality because we played in Louisiana for a few years and then in 2002 I ended up playing on the streets of New York for a whole summer, just staying with friends and surviving, and I booked our first tour outside of Louisiana and it quickly made us feel the appreciation for what we had, and it made us feel how special it was as well. At first we’d created a band to play the music we love, as we wanna hear it at home, and then we saw we were appreciated in other places as well. It was great especially because New York City is such a multicultural place, people understand cultures and they don’t see them as something foreign, but just another form of music and expression. Now we play a lot more abroad than we do at home. Yeah, I would say that has been a conscious effort we’ve made, which is to play beyond our genre, because the lines between genres are getting blurry. Being in a particular genre you have the tendency to have a hard time leaving it, and when you’re playing locally that’s fine, but as soon as you play nationally you start getting alienated from the general public. So our effort has been not to change our music, but to play venues where any kind of band plays, whether they’re rock or psychedelic or whatever. That effort is what led us to open for Arcade Fire, they could appreciate our music not for the fact that it’s Cajun, but for the fact they enjoyed it, and that’s what we want, for people to love us for who we are, not for the music we play. This must also push you out of being too complacent from a creative perspective, right? Exactly, playing music that is part of a genre and evolving and changing without the self-conscious judgment that comes from the outside, we had to really just purposely ignore opinions. The question is are we doing what we love? We play Cajun music because we love it, questions of tradition and authenticity don’t really exist. Does this mean we might hear you guys in a Kanye song soon? (Laughs) Actually we were featured on an album by a French hip-hop band called Le Peuple de l'Herbe, they do kind of Beastie Boys style -- I don’t know what you call it -- I wrote a song in the album in Cajun French, played the fiddle, so yeah I’d definitely go in the rap direction, we’re open to anything! For tickets to Beasts of the Southern Wild: Live visit Symphony Space. 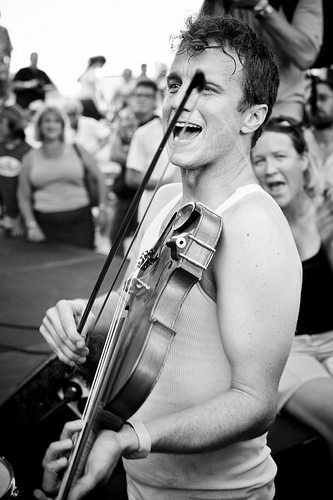 For more on Louis Michot and Lost Bayou Ramblers visit their official website.